Much new to be seen this week. The new smokebox wrapper is making good progress with bolts up to the 8.00 position. The cab is now in undercoat and the buffer beam preparatory work progressing. 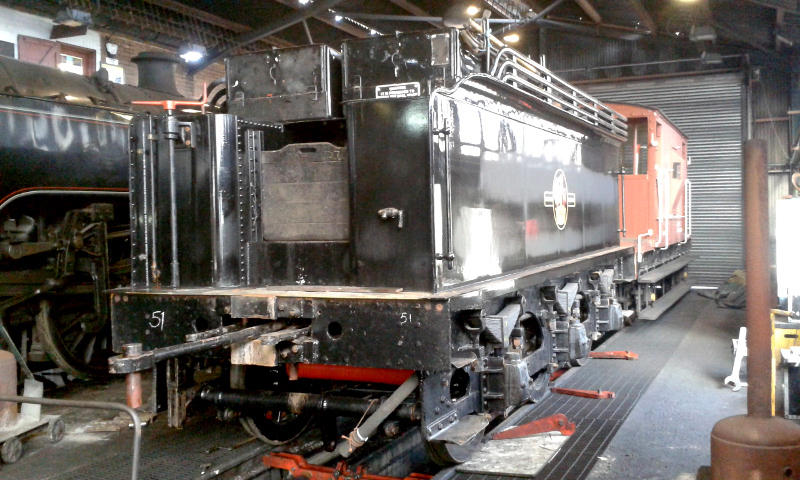 There was also lots of shunting round the MPD moving the J27 out so Eric Treacy could be put outside ready for its boiler lift . A call came from the MPD mid-morning asking if we could spare a couple of our team to help Andrew Jeffery and Jamie Lazenby down at the MPD on No 5 road to weigh the J27 tender. So Steve Hyman and Jon Bradley spent three parts of the day at the MPD. After completing the weighing Andrew gave us a copy of the weighing results; the photo shows the weighing results on the electronic display. Chris lawson visited on thursday and reports that the tender has now been filled with water and coal, weighed, and is now standing in No5 road in the MPD (see photo). There are some minor water leaks which are being attended to. 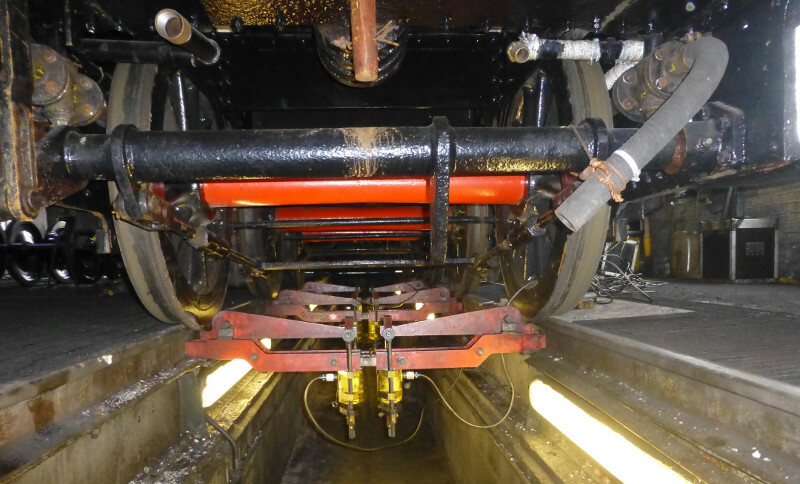 On the locomotive, the pipework in the cab is all but finished, with the brake valve reservoir release trigger now fitted. The cab sides have been prepped and the first paint applied (see photo). The broken glass in the sliding cab windows has been replaced by Derek Norris at Hopetown, and are due to be delivered to Grosmont by Nigel Hall in the next few days. 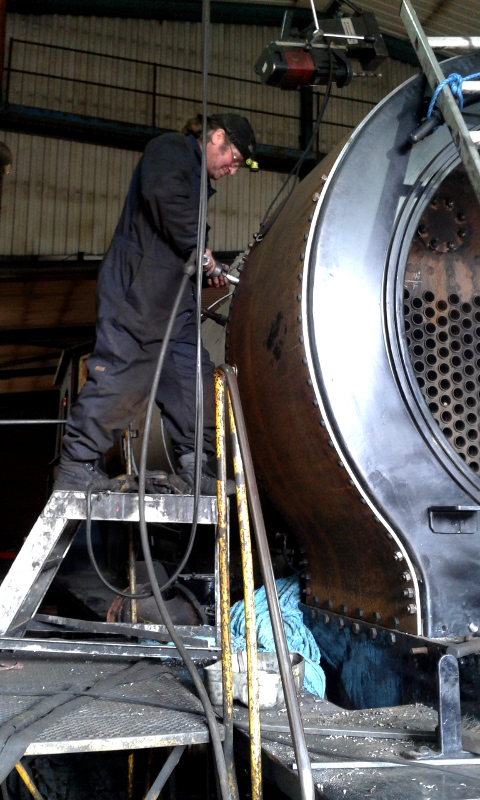 Underneath the locomotive, Sean has started the checks of pins and cotters, replacing where necessary, but this is a continuing task, and will be made easier once the locomotive moves out of the boiler shop and onto the pit in the running shed. The ash pan sprays are being redesigned as it was found that they went through the space where the rocking grate linkage should go. Then the grate will follow and the brick arch. At the smokebox, Phil Naylor has now bolted on the left hand side of the wrapper and is well on with the right hand side (see photo). The tops are currently overlapped and will be cut when fully fitted and tightened, to provide a clean line for welding together. 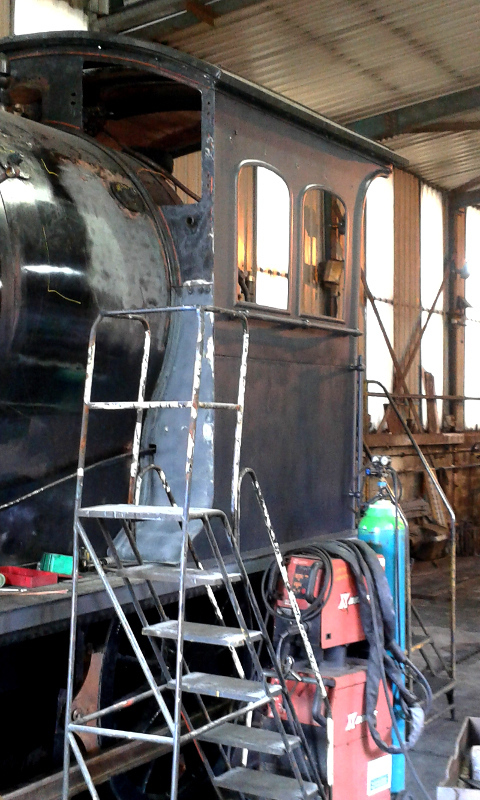 That is expected to be completed early next week and the hole will then be cut for the chimney, making sure it is placed centrally on the top of the smokebox. That will allow the blast pipe and steam pipe to be positioned and any adjustments made next week before they are finally fitted - in the case of the steam pipe before it is finally welded together. Work is just about on target, but some of the rocking grate and damper linkage is missing which will require replacement parts to be made. 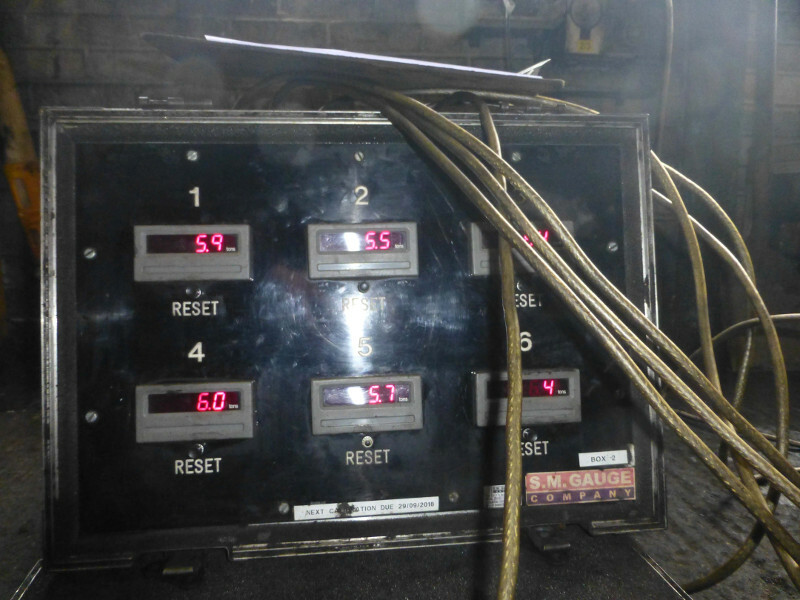 That has slightly delayed completion of those elements of the plan, but that is expected to be quickly caught up, and the steam test is still on schedule for the week beginning 8 April. 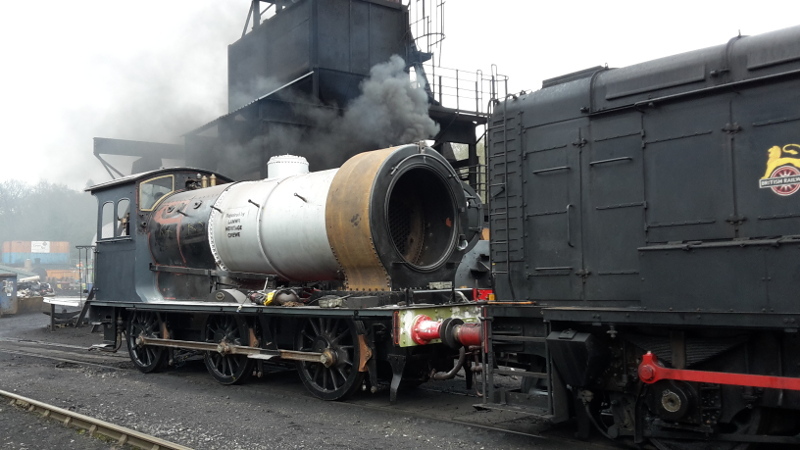 However, as reported in the separate Q6 note yesterday, the J27 was moved out of the boiler shop on Wednesday to allow Eric Treacy to be moved for its boiler lift (which was successfully carried out yesterday to the great interest of the many visitors).